I am in production mode, as you can see. I am getting ready for the Boston Handmade Marketplace show in Somerville. I thought I would take some pictures of the process of piercing. Everyone likes start to finishes, right? These are freehand flowers as you can see from the first photo, I only drew an outline for where I want the stamens, the rest was left to chance. First I make a divot where I am going to drill. I have also drilled out a hole for the bale. 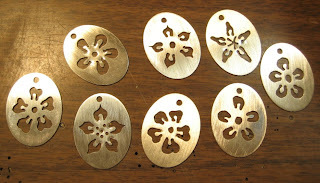 The first pendant does not have the petal holes drilled yet. 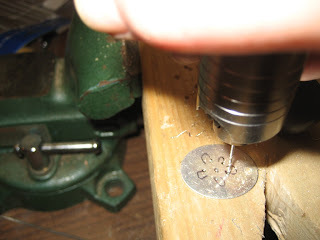 Then I use the smallest drill bit I have to drill the holes out. 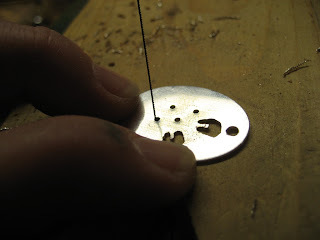 I thread the saw blade through the hole and start piercing out the petal. 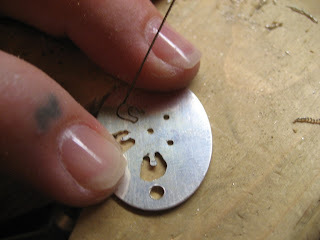 I keep removing the blade and re-inserting it into the next petal hole and pierce out the whole flower this way. 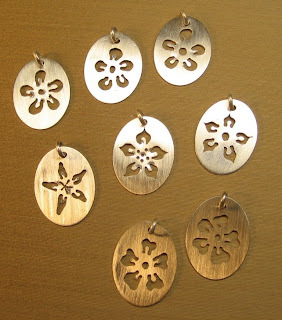 Then I get into the petals with needle files and smooth out all the edges and then sand them until all the tool marks are out and they are nice. I coiled up some 14gauge 1/2 round wire on a 4.5mm mandrel and cut them just like jumprings with my jumpring cutter, and then soldered them closed in the holes I drilled out earlier. Now I only have to string them onto a chain or cord. I think I got pretty good at making them. I can see the progress if I really study the photos of them all together. I'll definitely be making more of these. Nancy - these are beeyootiful! Remind when the thing in Somerville is again?? Jenn, there is a link in this post to the website for the show. Please check it out, it is my etsy team. The show is on June 28th!! These are SO LOVELY Nancy! I can't wait to see them in person! 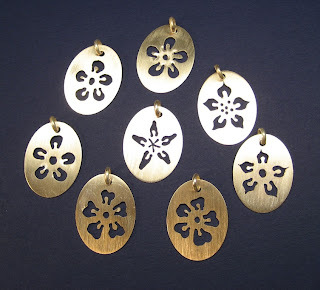 Nancy - these are SUPER pretty!! I love them - great piercing! OOOOOO Nancy, these are over the top way cool!!! I love them! I can see the progression too, good job!! Thanks so much Jess, Janice, Jenn and Nita! I love these, too!! I made a few more tonight, but experienced some problems as I broke about a zillion saw blades. I don't know why I can make 8 without breaking a single blade and then make one and break four saw blades. A mystery. Jenn, you have to call in sick to your conference, you will have much more fun at the Boston Handmade Marketplace! A very successful BH Marketplace! What's wrong with our society?